If you’ve never watched it, you’re missing out on some top notch drama. My daughter raved on and on about it for ages, and I always thought – um, zombies? (I’m more of a vampire fangirl myself), nah, that’s not for me, but when I gave it a go, I was literally blown away. 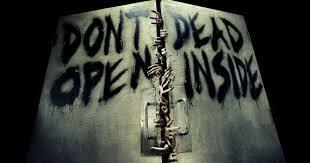 The Walking Dead is a sometimes harrowing story of survival and a roller coaster, edge of your seat, bumpy ride. So, my advice is – buckle up, catch up, and get yourselves on board with The Walking Dead. You’ll laugh, you’ll cry, but I promise you, you won’t regret it. ← My favourite children’s book.